Heat oven to 375°F. Make pie crusts as directed on box for Two-Crust Pie, using 9-inch glass pie plate. In large bowl, mix granulated sugar, 1/4 cup flour, the nutmeg, cinnamon and salt. Add pears, apples and lemon juice; toss to coat. Pour into crust-lined pie plate. Top with 2 tablespoons butter. In small bowl, mix oats, brown sugar and 1 tablespoon flour. Cut in 1/4 cup butter until mixture is crumbly. Sprinkle over fruit. In 1-quart saucepan, melt caramels with milk over low heat until smooth; add the pecans. Drizzle over praline mixture. Top with second crust and flute; cut slits in several places. If you like, brush top with milk and sprinkle with granulated sugar. Cover crust edge with strips of foil to prevent excessive browning. Place pie on middle oven rack; place sheet of foil on rack below pie in case of spillover. Bake 45 to 55 minutes or until golden brown. Cool completely, about 4 hours. 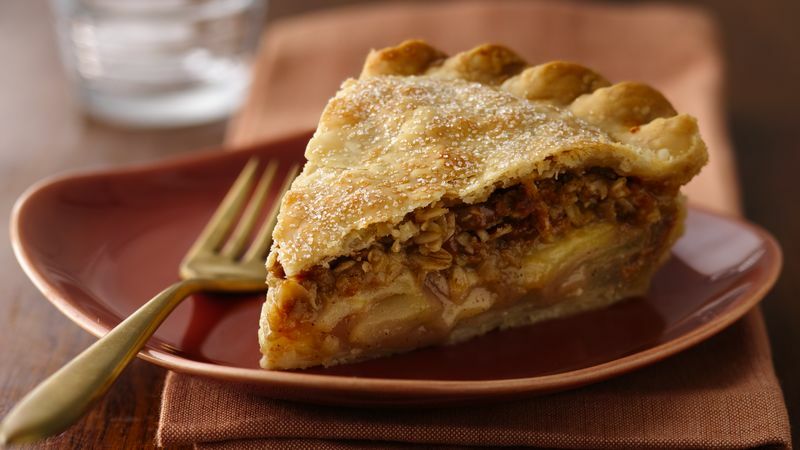 Purchase pears that are still firm to touch to decrease the chance of mushy pears in the baked pie.